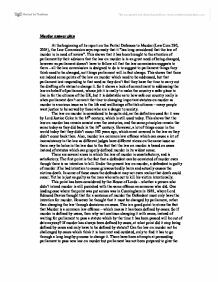 Murder answer plan At the beginning of its report on the Partial Defences to Murder (Law Com 290, 2004), the Law Commission says expressly that it "has long considered that the law of murder is in need of review". 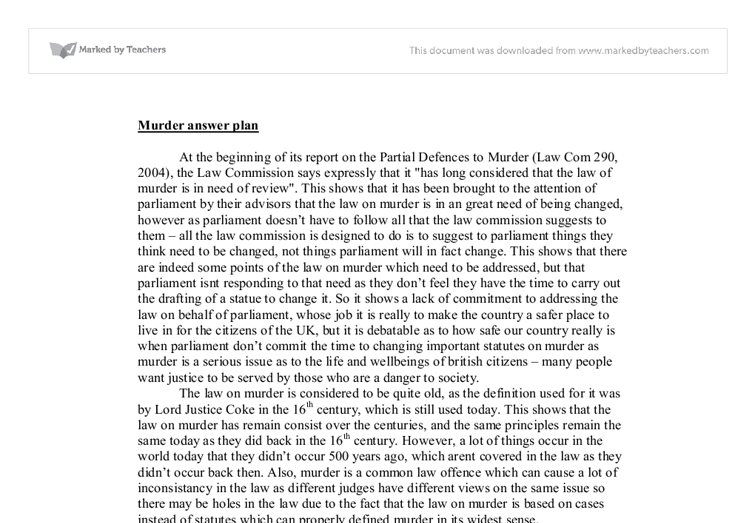 This shows that it has been brought to the attention of parliament by their advisors that the law on murder is in an great need of being changed, however as parliament doesn't have to follow all that the law commission suggests to them - all the law commission is designed to do is to suggest to parliament things they think need to be changed, not things parliament will in fact change. This shows that there are indeed some points of the law on murder which need to be addressed, but that parliament isnt responding to that need as they don't feel they have the time to carry out the drafting of a statue to change it. So it shows a lack of commitment to addressing the law on behalf of parliament, whose job it is really to make the country a safer place to live in for the citizens of the UK, but it is debatable as to how safe our country really is when parliament don't commit the time to changing important statutes on murder as murder is a serious issue as to the life and wellbeings of british citizens - many people want justice to be served by those who are a danger to society. ...read more. So with the issues of the sentence, unless they were a serial killer, there are other options to the sentence of murder and the mandatory life sentence can be avoided. The mandatory life sentence then distorts the law by making necessary the special defences of provocation and diminished responsibility. For with these special defences, the law on murder can be misued as murders think that even though they are facing a murder charge, they is always an option to escape from the life sentence of murder. As there is only one type of murder charge in the UK, anyone can use one of the defences and have a high probablity of having their sentence lessened by using one of the defences. This defeats the object of the mandatory life sentence which is to have consistancy in the law for murder - if your charged with murder, you get a set sentence, but through misues of defences, murder can have any sentence up to 15 years. Different "degrees" of murder (as in the USA), carrying different penalties or allowing judicial discretion, would make these special defences unnecessary, and would be a far more effective way of charging murder, as different types of murder would fit into different degrees, and then the inconsistancy in sentencing wouldn't exist. It also brings up the question of - whats the difference between a case that would be able to use a defence of diminished responisbility or provacation and reducing the sentencing to manslaughter and a full on murder case? ...read more. Extending the definition of murder to cover some or all abortions would be popular with some people and very unpopular with others, and would involve redefining of the point at which life begins. For the issue of when a life begins is quite a tough issue to resolve, and has many debates upon it. Does life start at conception, or when a person takes it first breathe? In law, a person is alive when they take their first breath, even if they arent independent of their mother. So even if a woman gets stabbed in the stomach whilst pregnant, and the baby dies before being born, this is not murder, even if the pregnancy is quite far along. So this could be quite traumatic for the mother who has gone through the whole pregnancy to have her baby die. In their report on Murder and Manslaughter (Law Com 304, November 2006) the Law Commission proposed a new structure. First degree murder (carrying a mandatory life sentence) would cover killing with the intention to kill (including cases of oblique intention), and killing intending to cause serious injury and foreseeing a serious risk of death. Second degree murder (carrying a discretionary life sentence) would cover killing with the intention to cause serious injury, Killing intending to cause some injury and foreseeing a serious risk of death, and killing with diminished responsibility, under provocation or in a suicide pact. Manslaughter (carrying a discretionary life sentence) would cover killing with foresight of some injury, or through gross negligence. It remains to be seen when (and whether) any of these proposals find their way into legislation. ...read more. Summary:There are several valid points made. However each point could have been supported by a precedent case or an illustrative case to give greater authority. At present the points read like assertions. Account should now be taken of the 2009 reforms to the part defences of loss of control and diminished responsibility. by his paranoid behaviour, believing his neighbours to be conspiring against him. The second stage of the test is to show that the abnormality was caused in one of three ways, inherent cause, mental arrest or retardation, or disease and injury. Young offenders can learn from community sentences such as unpaid work, curfew requirements, and fines and keep them away from areas with an exclusion requirement which is in the publics' interest. The drug rehabilitation requirement allows the offender that may have suffered drug abuse to reform and rehabilitate. When a judge is awarding, they will always give a judgement, and it is easier to see whether there are any decent grounds for an appeal. To further the problems with civil juries, cost for each party holds a factor.